Methodist Hospital in Merrillville, Indiana, was placed on lockdown early Friday morning after an elderly patient was fatally stabbed there and another body was discovered at a nearby home in Gary, officials said. slain at the couple's home on the 1500 block of Hovey Street in Gary shortly after 3 a.m., police said. One man, described only as a man in his 40s, was located on the 3800 block of Carolina Street, was arrested, and was being questioned at the Gary Police Department. Authorities said the suspect knew both of the victims but did not elaborate. "This is completely out of the ordinary and we do want to stress that although it seems as if this is some random act of violence. It is not," said Robert Wiley, the chief of detectives for the Merrillville Police Department. It wasn't immediately known which victim was slain first. Gary Police Chief Wade Ingram said officials from the Lake County Coroner's Office were trying to make that determination. The hospital facility, on the 8700 block of Broadway, in Merrillville, was put on lockdown immediately after the stabbing. That lockdown was lifted shortly after 5 a.m.
"I can assure you that the hospital is secure. Everyone is safe. Staff and patients are safe, and that the hospital is operating as usual, business as usual," said Wright Alcorn, the hospital's vice president of operations. 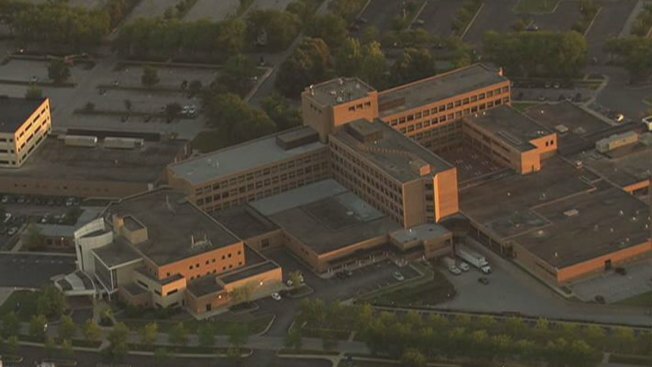 The hospital lockdown is the second in as many days in the Chicago area. Mount Sinai Hospital, on Chicago's west side, was locked down Thursday morning after what a hospital spokesperson said was a "possible threat."